The theme music to the show really is a tear jerker, isn’t it? It was composed by Peter Salem, and I think it’s as iconic a score as the music that was used to take us up the long winding road to Downton Abbey. While there’s rarely a dry eye on the set of the show, series producer and creator Heidi Thomas reportedly saves her tears for when they’re in the edit suite and the music starts. 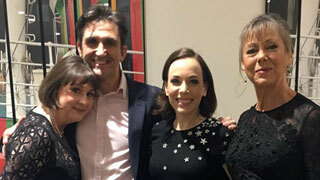 Fortunately she doesn’t have far to go when looking for a shoulder to cry on, as her husband, Stephen McGann, plays Dr. Turner in the series. The couple met when Thomas, who was a new playwright at the time, had a play opening in Liverpool, where the couple both grew up. McGann was cast to play the lead role and swears it was love at first sight. They didn’t become a couple though until several years later and eventually married in 1990. After a long time trying, the couple welcomed son Dominic into their little family, an event McGann says he thanks “God every day for”. After the birth of Dominic, McGann took a couple of years off work to be at home. He did the same again, when Dominic, who is now at university, was 12, and Thomas had gotten the job of re-writing Upstairs Downstairs and was also given the go-ahead to start working on Call the Midwife. The only way Thomas was able to do both was for her husband to put his acting career on hold for a couple of years, while he stayed home with their son. During the time he spent away from acting, McGann earned himself a postgraduate degree in Science Communication at Imperial College in London. 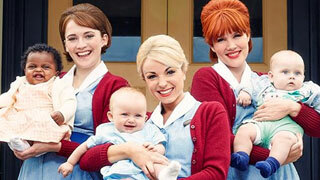 Season six of Call the Midwife premiers Sunday, April 2nd.